US stocks closed in negative territory on Wednesday as the Trump Administration’s pressure on China to reduce their trade imbalance, pushed the indices into the red. Weighing on sentiment are now growing concerns of a protectionist stance from the Trump Administration. This pushed the Dow down by 1%, and the S&P500 by 0.57% while the Nasdaq was off 0.19%. Is the “barney” between China and the Trump Administration over trade shaping up to be bigger than the “rumble in the jungle”? The White House is pressing China to cut its trade surplus with the United States by $100 billion. The US had a record $375 billion trade deficit with China in 2017, which made up nearly 70% of a global $566 billion trade gap. No details have emerged, other than the fact that the Trump Administration has asked China to come up with a plan to reduce the deficit. Additionally, this comes on top of a plan to put through $60 billion worth of tariffs on Chinese information technology, telecoms and consumer products. But as we have seen on so many occasions with President Trump, the bark often turns out to be worse than the bite. It’s a negotiating tactic that has played out time again in his first year in office. 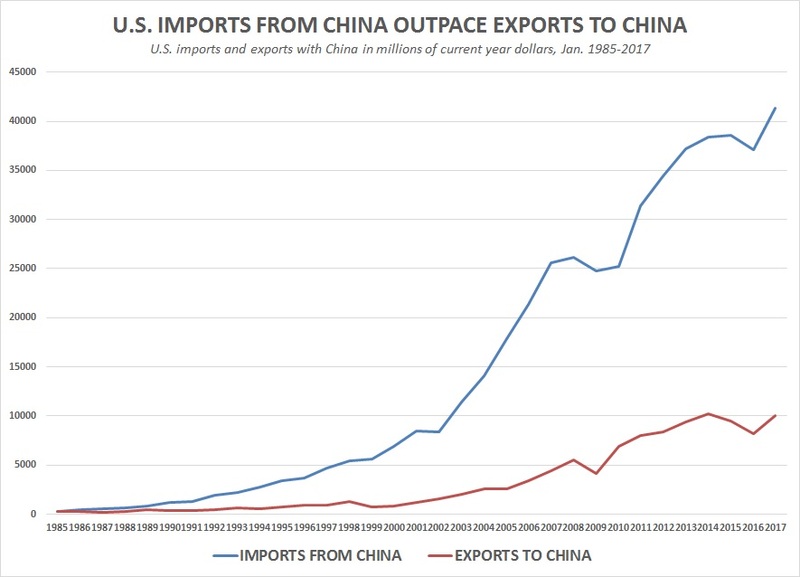 I can’t see the situation between China and the US deteriorating into a full blown trade war where both sides would definitively lose. Mutually Assured “Economic” destruction would be the order of the day. So, if Trump is consistent in his “inconsistency” we will probably see headline grabbing threats giving way to diplomacy and negotiation before too long. Also impacting sentiment were US retail sales, which for a third straight month declined in February as households cut back on purchases of motor vehicles and other big-ticket items. This impacts the market as brokers recalibrate their models for first quarter earnings in the corporate sector, but this also impacts economist forecasts of economic growth. The decline in retail sales over three successive months contrasts with the 17-year high in in consumer confidence, and the fact that the Trump Administration has put through a $1.5 trillion tax cut package. However, we will most likely see retail sales rebound in the June quarter with accelerating jobs growth, and the tax cuts likely to kick in later this year. The Commerce Department reported that retail sales slipped 0.1% in February versus economist forecasts of 0.3%, so the number was well below expectations. January data was favourably revised to show sales falling just 0.1% percent instead of 0.3% previously reported. Significantly however, this was the first-time retail sales have fallen for three successive months since April 2012. After the weaker core retail sales numbers, economists at the Atlanta Fed slashed its forecast to a 1.9% annualized rate from a 2.5% previously. Another firm, Macroeconomic Advisers cut its estimate to 1.7%. These forecasts and downward revisions clearly impacted sentiment but they may well be too aggressive. The market’s reaction was mild and on the prospects that retail sales will most likely rebound. In terms of stock movers, Alphabet shares rose 1% and online real estate portal Zillow Group advanced 2.3%. Falling from near all-time highs was video game developer Activision Blizzard and Apple, down 2.2% and 0.9% respectively. Miner Barrick Gold was ahead 1.1%, while the more silver-oriented producer Coeur Mining was down 0.8%. Alphabet, Apple, Activision, Barrick Gold, Coeur and Zillow are held in the managed account portfolios. European stocks were in positive territory for much of Wednesday but faded later in the day as Wall Street got away to a soft start. The pan-European Stoxx 600 slipped 0.15% for the day, while the Euro Stoxx 50 index of eurozone blue-chip stocks edged down 0.18%. Adidas, the German sporting shoe, clothing and accessory giant was in the spotlight Wednesday and soared 11.2% after announcing a multi-year share buyback program of up to €3.0 billion. Volkswagen shares gained 2.2% after yesterday’s announcement of a major push into the electric vehicle market and on the heels of an almost doubling in operating profit for 2017. Peer BMW slipped 1.9% in trading. European banks generally had a down day, with the likes of BNP Paribas falling 1.5% and Société Générale dipping 1.3%. Volkswagen, BNP Paribus and Société Générale are held in the managed account portfolios. BMW is recommended by the research team. Asian stocks fell across the region on Wednesday as Donald Trump’s blocking of Broadcom’s proposed takeover of Qualcomm on security grounds and the firing of his Secretary of State, fanned investor fears of protectionism and an increasingly inward looking US economy. There was also media reports Trump was considering substantial tariffs on Chinese goods. Japanese shares fell after four days of gains, with the Nikkei down 0.87% for the day. Semiconductor-related shares declined on the blocking of the Qualcomm deal, with Tokyo Electron, Sumco and Advantest all closing around 2% lower. Prime Minister Shinzo Abe denied any wrongdoing in a falsifying document scandal that implicated his finance minister. In economic news, minutes from the Bank of Japan’s January meeting showed that board members expect the country’s economic growth to continue at a decent pace. Separately, the value of core machine orders in Japan surged a seasonally adjusted 8.2% in January. Despite the strong showing, trading in manufacturers was mixed. Component maker THK was down 1.2%, while robot expert Fanuc dipped 0.9% and peer Yaskawa Electric outperformed with a 2.5% increase. Sony was another company bucking the trend, with a 0.8% rise. Sony, and Fanuc are held in the Global Contrarian Fund. Yaskawa and THK are holdings in the managed account portfolios. In corporate news, Walt Disney bucked broader market weakness to finish in positive territory after the entertainment conglomerate announced a strategic reorganization of its businesses into four segments. The company announced a newly-formed Direct-to-Consumer (DTC) and International division which will effectively combine Parks, Experiences and Consumer Products, Media Networks and Studio Entertainment with the changes put through this week. Disney is set to become a major force in DTC streaming holding a huge back catalogue and many movie franchises. Disney is a core holding in the Global Contrarian Fund. The major changes relate to the first two. The DTC and International segment reflects the new focus on shifting towards online viewing. According to Disney, the new segment will be comprised of Disney’s international media businesses globally and will house the yet to be named Disney-branded DTC streaming service to launch in late 2019. The new Parks segment will bring together parks and consumer products to provide more compelling all around entertainment experiences. Chinese social networking giant Tencent Holdings reportedly made two significant investments in Chinese video streaming platforms this week and acquired a cornerstone stake in a local film production company behind some domestic hits at cinemas. First it was reported that Tencent sank US$632 million into Douyu, a live-streaming platform that specialises in games and other entertainment content, somewhat like Twitch. DouyuTv reportedly has a monthly active audience of about 13 million users currently, which is higher than competitors Huya and PandaTV. Then it was reported Tencent had led a series B funding round in Huya. Tencent’s investment was not disclosed, but the round raised a total of US$462 million. Tencent reportedly structured its investment so that it has the right to purchase additional shares to go to a 50.1% ownership position. Huya is reportedly preparing for an IPO in the United States, while Douyu is considering Hong Kong. Given the vast potential market in China and the “walled garden” nature of the market, a bunch of Chinese companies are vying for leadership, while international leaders (i.e. Netflix, Amazon) have largely been shut out of the market. 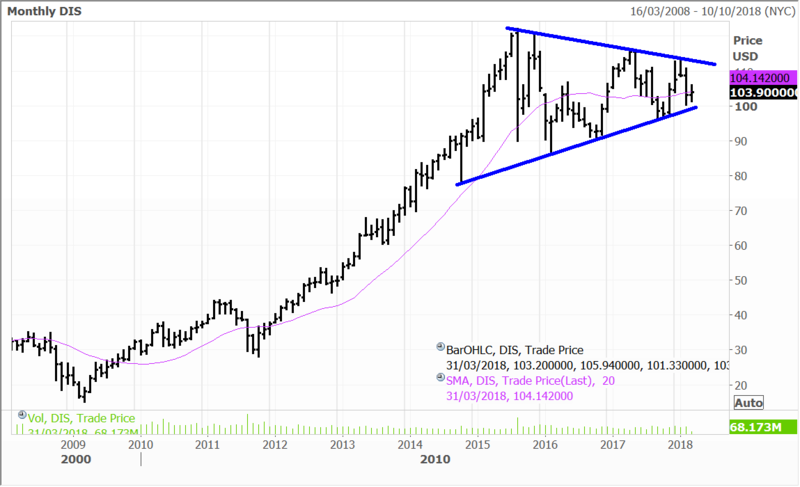 Global Contrarian Fund holding Baidu is a leader in the broader video streaming space in China and has plans to list that unit, called iQiyi, in the US this year. Finally, Tencent invested US$524 million to buy a 27.6% stake in New Classics Media, the production company behind Chinese box office hits such as Never Say Die and Goodbye Mr. Loser, which combined pulled in more than US$550 million at the box office. Tencent’s core social network and gaming businesses are thriving and generating the cash flows the company has used to broaden its scope into a wide array of technology areas. Tencent is held in the managed account portfolios, with the shares more than doubling over the past year. RCA Records, label of Miley Cyrus, which is owned by Sony Corp was sued for $300 million by Jamaican songwriter Michael May over the singer’s 2013 smash hit “We can’t stop”. He said the song he recorded 25 years earlier is closely resembled by her and that she is overstepping his copyright. Neither Cyrus or Sony did immediately respond. Sony’s shares closed higher by 0.82%. Sony Corp is held in the Global Contrarian Fund and in the managed account portfolios. Next week, Thursday March 22nd, will mark 12 months since the IPO of our largest LIC, the Fat Prophets Global Contrarian Fund (FPC.AX). With the IPO we structured a unique option offering. All investors in the IPO received a 1 for 1 option with their shares. This means if they bought 10,000 shares in the IPO, they were also entitled to 10,000 options. The options allow the holder to acquire new shares in FPC at $1.10, any time between when they vest (on 22 March 2018) and over the following 12 months to 21 March 2019. Disclaimer: The Fat Prophets Global Contrarian Fund declares a holding in Coeur Mining, Volkswagen, BHP, Sands China, MGM China, Wynn Macau, Fanuc, Sony, Walt Disney and Baidu.